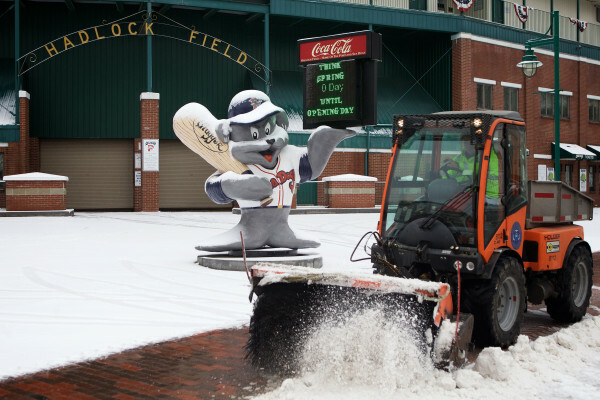 A city vehicle clears overnight snow in front of Hadlock Filed Thursday morning in Portland on the Sea Dog's baseball team's opening day. 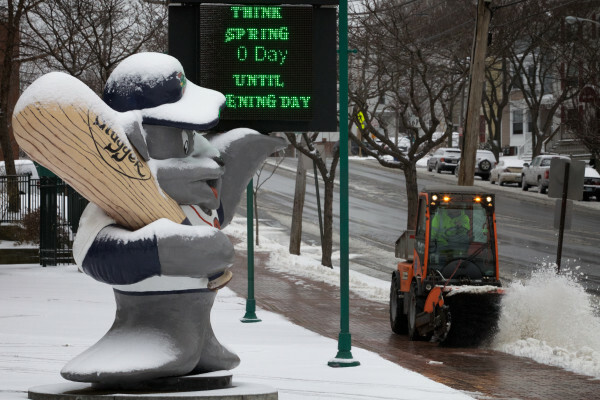 PORTLAND, Maine —The Portland Sea Dogs’ opener against the Reading Fightin Phils at Hadlock Field on Thursday has been postponed because of unplayable field conditions. 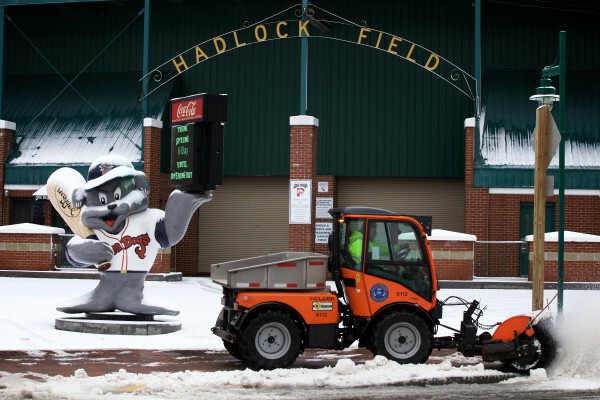 Several inches of snow fell on Hadlock Field on Wednesday night. The Sea Dogs guaranteed baseball would be played at Hadlock Field on opening day. As a result, anyone with tickets for Thursday’s game may exchange each ticket for two tickets of equal or lesser value to any 2015 Sea Dogs home game, subject to availability. On-camera meteorologist Keith Carson from The Weather Channel was scheduled to throw out the ceremonial first pitch. “The team would not hold Carson responsible for the opening day snowfall,” Iacuessa said. The Sea Dogs are scheduled to play at 6 p.m. Friday at Hadlock Field against the Fightin Phils. Thursday’s postponed game will be made up as a single admission doubleheader at 1 p.m. May 23. The doubleheader will consist of two seven-inning games. Tickets for May 23 are good for both games of the doubleheader.